Eliminate Sloppy Shift Feel Forever! These CNC machined aluminum shift bushings tighten up the movement of your gearbox cables, literally connecting your hand to the gears. When changing gear the OE rubber bushings flex causing a delay when trying to engage the gearbox into gear. 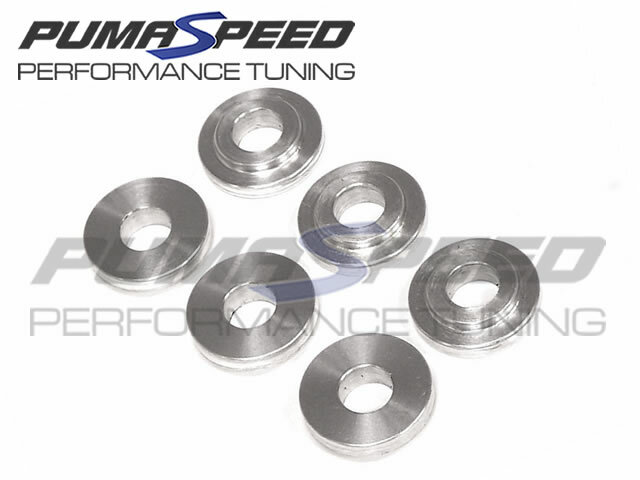 The Pumaspeed bushings eliminate this delay and provide a precision shift simply by replacing the rubber parts with aluminium. If you're looking to feel your shifts without the rubber sloppiness, these aluminium bushings are the answer! The Pumaspeed Workshop team are ready to fit the Pumaspeed Aluminium Shift Bracket Bush Kit in our Head Office located here. Therefore making parts and labour a total cost £102.49 (inc. VAT). Pumaspeed have a specialist distribution team that can dispatch the Pumaspeed Aluminium Shift Bracket Bush Kit to any destination worldwide.